Vital American Industrial Metallers DOPE have lined up the release of their long-awaited sixth studio album, ‘Blood Money Pt. 1’, on Steamhammer / SPV on October 28th and announced their first ever UK headline gig on November 7th, when the classic Dope line up of Edsel Dope, Acey Slade, Virus and Racci Shay are set to play live at London’s 02 Islington Academy. ‘Blood Money Pt. 1’, the follow up to 2009’s highly acclaimed ‘No Regrets’ album, will be available as a DigiPak CD, double gatefold 180 gram transparent red vinyl LP, (with printed inner sleeves + album CD in a cardboard sleeve) and download. Edsel Dope’s responsibilities on ‘Blood Money’ include producing, engineering, mixing, programming, art conception, video direction, vocals, & live drums, as well as sharing writing and performance duties on guitar, bass, and more. 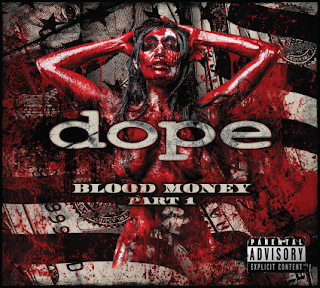 ‘Blood Money’ features a unique mix of support musicians; Dope mainstay guitarist Virus can be heard on multiple tracks, while new musical partner Nikk Dibs played a large role in guitar / bass / programming and production. Former Chimera guitarist Matt Szlachta and Chicago shredder DJ Nelson were also recruited by Edsel for some of the guitar work and collaborations on ‘Blood Money’. “I appreciate all of the people that contributed to this album and to Dope, in general throughout the years” says Edsel. “I have a talented support group, and a great team of (go to guys) for touring and recording. Every album has consisted of a different line up, so I have a lot of talented people to choose from at any given time. We are all grown-ups and I have a truly great relationship with all of these guys. Dope has been a bit of a breeding ground for talent; so many of the dudes that came up through the Dope fraternity have gone on to be part of some very successful things”: Device, Static-X, The Murder Dolls, Joan Jett & The Black Hearts, and most recently Marilyn Manson and The Misfits Reunion, to name a few.